If you ever wanted to convert a non-baseball fan into becoming a baseball fan, this 2-game series was the time to do it, especially for an FIU fan. The first game was held at Mark Light Field at Alex Rodriguez Park. Robert Garcia threw a 1-hitter through 7 innings, while striking out 9. Meanwhile, his boys pummeled UM, putting up 12 runs and only allowing 1! 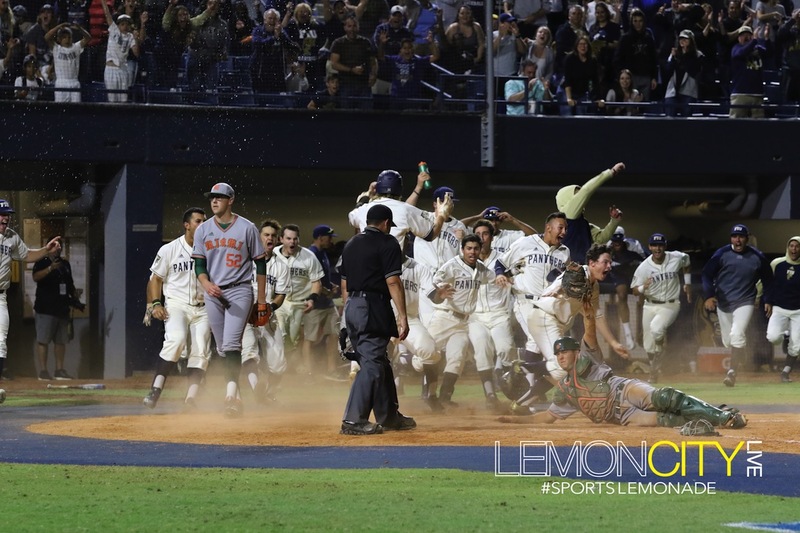 It’s a very rare occasion when UM gets embarrassed at home, so you know they were out for blood, as game 2 moved across town to FIU’s field. This cross-town rivalry had been dormant since 2008. That’s the last time they both met in the regular season. Needless to say, it’s always a big deal when these 2 teams play each other. The pregame festivities were a fun-for-all occasion. Kids had bounce houses, zip-lines and other activities. Adults had food trucks, and games, including one where you test your pitching prowess by testing your accuracy and pitching speed. I didn’t want to embarrass anyone, so I left it to the amateurs. 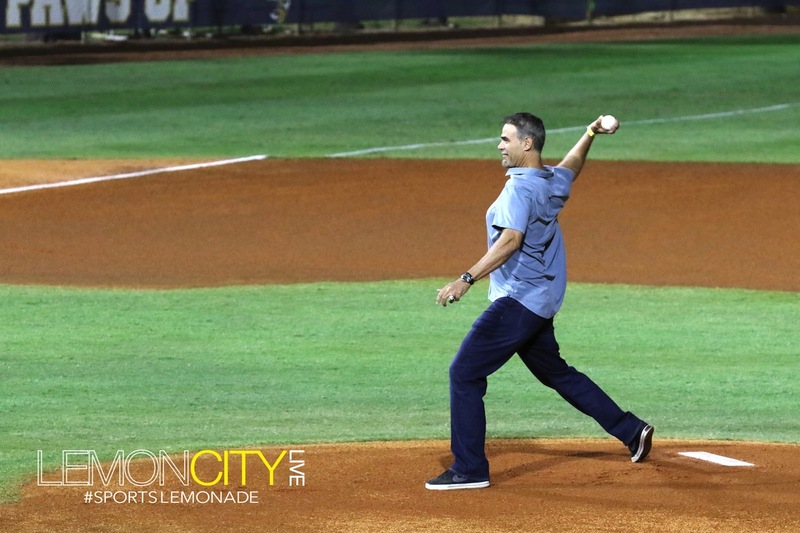 Two time World Series Champion, 2007 World Series MVP and FIU Alumni Mike Lowell throwing out the first pitch at the game. Throwing out the first pitch tonight was 2003 Florida Marlins World Series Champion & 2007 Boston Red Sox World Series MVP Champion, Mike Lowell! More on him later. The stands were almost at capacity. It’s barely worthy of being called a “road trip” for Canes fans making the drive to FIU. Although, they did have to drive through that horrid Miami rush hour. It’s enough to make anyone want to seek out and kill their enemies. This was literally how tense things got between Canes and FIU players, as I’m sure the Canes felt disrespected after being embarrassed at home by 11 runs. In the stands though, it was a party. There was a live latin band, bumpin’ Oro Solido’s “Ta Encendio”(look it up), which translates into “It’s Lit!”, so you know there was a lot of gyration going on. Anywho, the Canes came ready to battle. They loaded the bases from the get-go. However, 2 were left on base, and the Canes finished the inning with only 1 run. However, it was at this moment that my Lemon City team and I noticed the most epic Letoochee coming out of Hunter Tackett’s ball cap. More on Letoochee’s later on. FIU would threaten in the 2nd and the 4th innings, both times leaving 2 runners in scoring position, only to come away empty. A wise man once told me, and I’m paraphrasing, “If you don’t take advantage of your opportunities, your opposition will take advantage of your struggles”. In the top of the 6th, the Canes would do just that, as Barry Buchowski hit into the right-center gap for an RBI that brought in Carl Chester, making it 2-0. At this point, the Canes, I’m sure were “feeling themselves”, as Beyonce likes to say, but it would be short-lived. In the bottom of the 6th, the Panthers would get on board without even earning a hit. You can thank a walk, sacrifice bunt and a wild pitch for that. In the very next inning, FIU decided that enough was enough. Zach Files hits a stand-up double into center field. Jack Schaaf comes into pinch hit for Eddie Silva (another Letoochee candidate) and singles into left field, bringing in Zach Files. The game is now tied, and the Canes are fuming. Apparently, they decided to take out their aggressions on the visitor’s dugout. Let’s move into the top of the 9th inning. Michelangeli is on 1st base with 1 out, and Joe Gomez grounds a ball into the infield. Michelangeli slides hard into 2nd, trying to break up the double play, but 2nd baseman Derek Cartaya wasn’t fazed, as he makes a spectacular play at 2nd, and throws out Gomez at first to end the inning for the Canes. The trash-talking would reach it’s climax at this point, as both Cartaya and Michelangeli, better known as the Bat-Flip King, would all but whisper sweet nothings at each other all the way to their respective dugouts. Bottom of the 9th. Designated hitter, JC Escara hits a single, and is replaced by pinch runner Kolby Follis, who advanced to 2nd base off a sac-bunt. Then, pandemonium would ensue, as Nick Day would blast a ball into the warning track, forcing Carl Chester to make one of the more spectacular over the shoulder catches I’ve seen, but it would be overshadowed by the base-running of Kolby Follis. The dude tagged up from second base, booked it all the way home, avoided the tag at the plate and completed the walk-off victory! What a way to complete a 2 game series against your cross-town rivals. 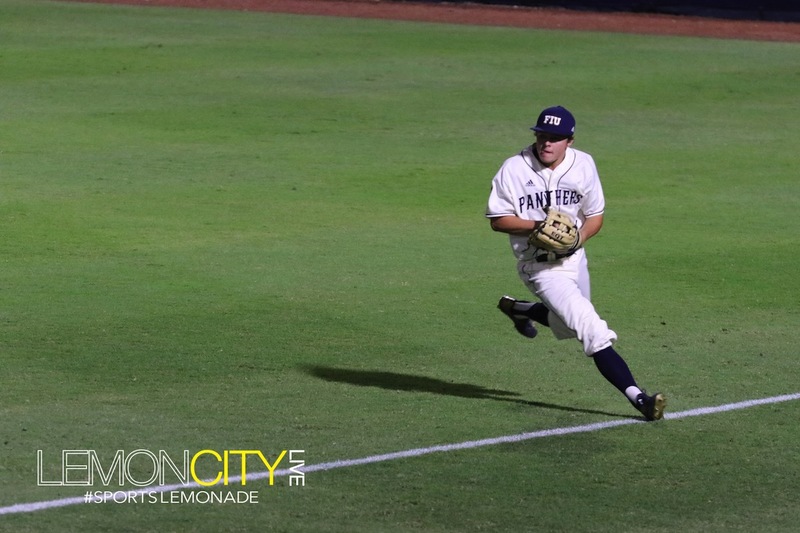 And with FIU securing the #1 recruiting class in all of NCAA baseball this year, the future looks incredibly bright for this Panthers program. Mike Lowell sure was excited about it! Oh yeah, we interviewed Mike Lowell. If you scroll down you can check it out. Great stuff from the World Series MVP. Makes me wanna grow a Letoochee. Finally, what’s a Letoochee, you ask? It’s actually a funny way to pronounce lettuce, coined by our very own Edlose. Picture a guy wearing a ball cap with a bunch of hair coming out of the back. Traditional Letoochees are wavy, and hard to manage, like lettuce. But, you also have your flowing Letoochees, like Noah Syndergaard, or your phro Letoochees like Coco Crisp. Good stuff. College baseball is most definitely incredibly fun to watch. These kids are hungry, and they’re fighting for the slim chance to become MLB ball players. 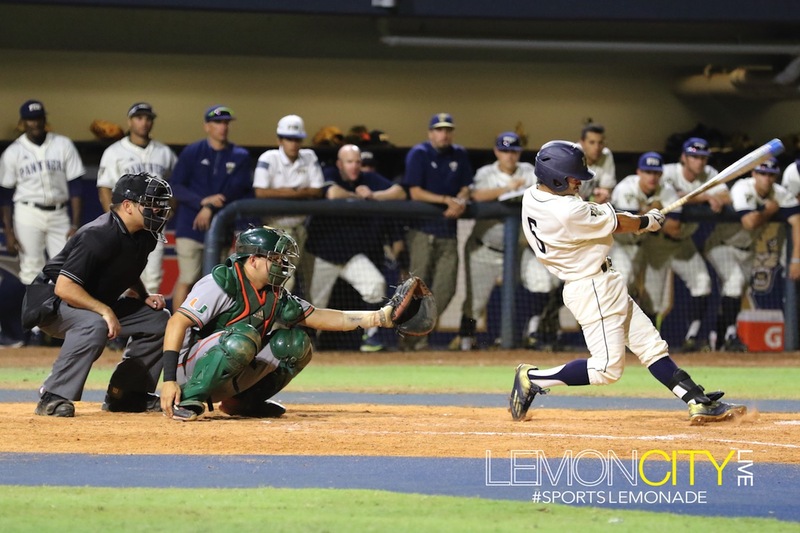 If you have a chance, go out and check out either FIU Baseball from FIU Baseball Stadium, or UM Canes Baseball from Mark Light Field at Alex Rodriguez Park. For a complete photo gallery from this game, please CLICK HERE.